The Doctor woke feeling happy. He wondered why that was for a moment. He wondered why he was sleeping on a futon in a room that didn’t have a faint vibration. It was a long time since he had slept anywhere but in the TARDIS. Usually he didn’t dare let himself relax unless he was safe within its walls. But it was Christmas morning and he had brought his friends to the Austrian Alps to enjoy the festive season on terra firma cognita. When he asked them what they wanted to do for Christmas their different suggestions had all had three things in common. They wanted to spend it on Earth. They wanted to be together - just the four of them. And no monsters, creatures from alternative dimensions, or alien invasions. So far he had been able to fulfil all three of those requests. He rented a ski chalet with fabulous views. 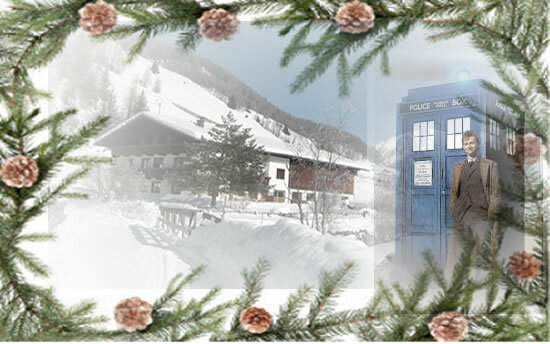 They went Christmas shopping by TARDIS in Innsbruck and enjoyed the local festive customs thoroughly before retreating back to their hideaway with food and drink and presents enough for eight people, let alone four. The only thing he wouldn’t have, to the bewilderment of his friends, was a Christmas Tree. He wouldn’t give them any more details, except to say that he’d had too much trouble with them in the past. With or without a Christmas tree, it was still Christmas. He got up from the bed and folded it up into a sofa. He pulled on his clothes and combed his hair. In honour of the day his tie had a holly sprig pattern but otherwise his silhouette was a familiar one as he stood at the window and looked out at the snow-capped mountains and the drop down into the Wipptal, the valley in which Innsbruck nestled. With his eyesight he could make out the rooftops of the town, but his friends probably couldn’t. “I love this planet,” he thought as he drank in the beauty of the scene. He came from a planet that had been equally beautiful, but he was able to forget at times like this that he was a homeless wanderer and feel a kind of contentment looking out at peaceful places like this. Then something happened to jolt his contentment. For a split second he saw the scene in negative, as if somebody was playing with the colour settings of the world. It was no more than a split second. And he wasn’t even sure if it was his eyes playing tricks on him. Except his eyes didn’t usually play tricks. And although nobody could accuse him of lacking imagination, it didn’t usually run wild. No, he told himself. Whatever it is, it's somebody else’s problem. We’re going to have CHRISTMAS in peace. “Hey, happy Christmas!” He turned as Wyn came into the room. She ran and hugged him simply because it was Christmas. He hugged her back, holding onto her maybe a moment longer than was strictly necessary. He only had her company for a few days more. By the time Christmas was over it would be New Year and she had to go home to her parents, brothers, Llanfairfach and A Levels. He had become fond enough of her in the past year to feel sad at the impending parting. The Doctor laughed and refrained from reminding Wyn that she was a girl too. But he’d travelled in the TARDIS with enough females to know how long their bathroom activities should take and Jasmin was no worse than any of the others. They had all bought each other presents. They had split up in Innsbruck and gone looking for small gifts to wrap up for each other. Now the fruits of their labour were revealed as they spent a pleasant half hour opening prettily wrapped boxes. The Doctor watched as his friends told each other how much they always wanted exactly what the other had given them. He smiled to think how something quite ordinary, like a CD that could be bought in any department store on the planet was so much more special when it was wrapped up in paper and given to another person on this day of the year. It was something quite unique about the Human race that mundane consumer goods could be given such symbolism and by that symbolism make people extraordinarily happy. “These are from me,” he said, passing two small boxes, beautifully wrapped in gold paper to Alec and Jasmin. They opened them and he enjoyed the looks on their faces as they saw what he had given them. Jasmin smiled widely as she held up the finely made gold rope chain with a unique pendant on it. It was a gold representation of the symbol they had come to know as the Seal of Rassilon. It was studded with diamonds and shone as brightly as her eyes as The Doctor fastened it around her neck. “I’ll treasure it forever,” she told him, and he knew she would. “Same here,” Alec exclaimed as he looked at the custom made wristwatch The Doctor had given him. The same unique seal that only somebody who had known The Doctor would recognise was engraved on the back. The face of the watch was decorated with what would look to anyone else like a swirling pattern of circles. To those who had travelled in the TARDIS it spelled the Latin phrase “Nunc Est” in High Gallifreyan. “Now is the time,” The Doctor told them. “Time for what?” Wyn asked. “Like Carpe Diem but not quite so clichéd,” Alec said as he put the watch on his wrist and knew he would never buy another wristwatch as long as he lived. They all looked expectantly as he dived under the tree and pulled out a LARGE box with Wyn’s name on it. She had been looking at it for ages, wondering what he had got for her. “This is something very special. There have only been four others like it in the whole universe. And they are with people I loved dearly.” The Doctor handed her the box. It was heavy. She knelt down on the floor to open it. “Doctor,” she said. “This present is vibrating.” She looked at him but he just grinned. She continued to tear off the paper. The Doctor wasn’t likely to have given her a time bomb for a present, she was sure. She shredded the paper and pulled at the cardboard box inside then jumped back as her present whirred and rolled out to meet her. “Hello, K-9,” Wyn said experimentally. Wyn put the robot puppy back down on the floor. It wagged its tail and turned its head before whirring across the floor to The Doctor. “I do not need to consume synthetic fibres for nutrients, mistress,” K-9 assured her. “Also I have hover capability for getting upstairs and a shremec system.” To prove that he flipped over on his back and then upright again. Wyn reached out and stroked his head. His ears shaped like mini satellite dishes span around as if he enjoyed that. “Affirmative,” K-9 said with no trace of modesty. The Doctor’s face when he looked at the gift they had given him was worth every penny they had pooled together. He lifted it from the box and held it almost reverently for a long time, weighing it in his hands. He smiled broadly as he saw that a leather craftsman somewhere in Innsbruck had carefully tooled onto the scabbard that same symbol that he’d had a custom jeweller spend so much time and effort on incorporating into a necklace, watch and dog tag. The difference was that he’d used a bit of Time Lord trickery to retrospectively place his orders a month in advance so that they were ready when he picked them up a few days ago. “You’re a pacifist who sword fights better than D’Artagnan,” Wyn told him. His friends looked at him then at each other. Was he teasing them? Wasn’t D’Artagnan a fictional character? None of them were sure. But it didn’t matter. What mattered was that they had been able to give The Doctor something that he would treasure and remember them all by. “Can K-9 come with us?” Wyn asked. He laughed and went to the kitchen. He was in the middle of peeling potatoes when they all stepped out of the chalet dressed and equipped for a morning’s skiing. They waved to him and he waved back cheerily. As soon as they were out of sight, though, he left the potatoes in the sink and picked up the turkey from the table. Wyn was right about there not being enough time to cook it. But he was a Time Lord after all, and he had planned for this. The TARDIS was parked up next to the chalet. Apart from the shopping trip it had not been needed since they arrived. Ski lifts and brisk, healthy walks had served them instead. He slipped through to the kitchen first. He put the prepared turkey in the TARDIS oven and set the timer. Then he went back to the console room. “Merry Christmas,” he whispered, patting the console. “Fancy a nice slow orbit around the Earth, old girl, just me and you.” He set the dematerialisation switch and a moment later the TARDIS was in orbit above Europe. He smiled. Earth was one of the most beautiful planets in the galaxy. He had sometimes berated Humans for their collective stupidity, their near extermination of themselves in so many blundering ways, their petty and senseless cruelties and short-sightedness, but at the same time he loved them, and their planet, the only place he came close to calling home now. It looked so peaceful from here. On Christmas Day, 2010, it wasn’t entirely true. There were problems that had gone on there for so long that even that day of peace and goodwill to all men was anything but for a lot of mankind. As the TARDIS passed over the Middle East he reflected sadly that the place where Christmas began for those who celebrate it was still a smouldering cauldron that better men than himself would despair of. He only kept from despair because he knew for certain that one day mankind DID get it right and all those conflicts would be over. There truly would be Peace on Earth. Of course, even then, they had the problem of other races who wanted to war with them and conquer them, and he had spent a good part of his own lifetime stopping that happening. But nobody ever said that peace and contentment came easy. There was a price to pay for every moment of ease. He knew that perhaps better than any being in the universe. He was at least enjoying some peace and contentment now. He had three wonderful friends he was sharing this Earth festive season with, and he had nothing worrying him except making sure he got back to the chalet with the turkey perfectly cooked before they discovered his subterfuge. “When you get home you’ll miss The Doctor,” Alec told her. “I wonder if he really CAN cook,” Jasmin said as the ski lift arrived. The TARDIS materialised once more by the side of the chalet. The Doctor slipped into the kitchen and put the perfectly cooked turkey on a serving dish and covered it with a clean cloth. Meanwhile he put the pudding in the steamer and set to work preparing the vegetables and a panful of stuffing. He had been away for an hour of local time and five hours of his personal time. He wondered if he had, technically, broken any of the Laws of Time. He knew there wasn’t specifically one that said “No using the TARDIS to cook Christmas dinner.” But there was one about using time travel for personal convenience. Not a major infraction. Nothing that would cause ruptures of the space-time continuum or anything of that sort. But he had a feeling he might have committed a small misdemeanour under the law of his lost world. It would be worth it to see their faces when they sat down to lunch. They were heading back to the chalet, exhilarated by a morning of healthy exercise in the good, clean air of the Wipptal, chatting together about everything and nothing. But they all knew it wasn’t. The Doctor saw it, too. He was standing at the window watching his friends make their way up the slope. They were still too far away for any but a Time Lord with superior eyesight to see, but they were on their way and lunch was nearly ready. Then it happened, again. This time he knew his eyes weren’t playing tricks. Something was playing tricks with his eyes. “What do you make of it, K-9?” he asked. “Insufficient evidence to compute a hypothesis,” K-9 replied. “Yeah, I thought you’d say that,” The Doctor said. But when he turned from the window he knew it wasn’t just his eyes that were being tricked. Somebody was pulling a fast one on the world. As one they stopped calling and stared at The Doctor. “It’s Christmas Day. Where do you think a baby would come from,” The Doctor said with a wide grin as he cuddled the child. “Ah. You reckon the two things are connected?” Jasmin asked. “How and why?” Wyn asked. Jasmin took the baby from him and he disappeared into the kitchen, telling the other two to start setting the table. They looked at each other and shrugged. If The Doctor wasn’t worried why should they be? “It’s an alien baby?” Jasmin sat down by the window with the baby. Wyn and Alec carried on sorting out the table for their meal. K-9 hovered loyally at Wyn’s side. “Yes, it is,” Jasmin was sure of that much. Apart from the eyes it looked Human enough, healthily pink and round-faced like a baby should be. It had ten…. No it didn’t. It had twelve toes, and ten fingers and two thumbs. She counted again to be sure, but it was unmistakeable. “Pick one,” The Doctor answered her, coming to the door with a large spoon in his hand. “That’ll do then,” The Doctor said. “Yes, but….” Wyn looked at Jasmin and ‘Ali’. Of course naming the baby made a kind of sense. But she remembered something The Doctor had told her. The other Doctor. He had talked about a lesson that was taught at his Time Lord university – Emotional Detachment. The first rule of Emotional Detachment was not to know the names of people you don’t want to be attached to. If you don’t know their names then you cannot be close to them. You cannot feel for them, you cannot grieve for them after they are gone. They sat. K-9 settled under the table by Wyn’s feet. Jasmin brought baby Ali to the table with her. The Doctor brought the dishes of potatoes and vegetables and stuffing out from the kitchen. Alec opened a bottle of wine and poured for everyone except Jasmin, who stuck with cordial as usual. Meanwhile The Doctor brought in the beautifully cooked turkey on a large platter. They all looked suitably surprised and impressed by his culinary skills. “Where did that come from?” Jasmin asked when he passed her a bottle for the baby. “They appeared in the fridge at the same time he arrived,” The Doctor answered as he let Jasmin feed the baby and stood to carve. “Weirder and weirder,” Wyn said as she helped herself to roast potatoes and stuffing to go with the turkey. They did enjoy the meal. They all admitted they had been wrong to doubt The Doctor’s culinary skills and ate their fill. It was a cheerful meal, and Ali, despite the mystery of his presence among them, did not distract them from their enjoyment of their Christmas lunch together. “I’m sure he’s getting heavier,” Jasmin said as they waited for The Doctor to bring in the Christmas pudding. “You know about baby development?” Wyn asked him in surprise. “Oh, to be an only child!” Wyn sighed. So did Jasmin. The two things they had in common were being the youngest of the family and being the only girl. The Doctor agreed that Ali looked bigger now. But he refused to do anything about it until they had eaten their Christmas pudding. First the meal was thoroughly and properly eaten and the dishes left in the kitchen to be washed at another time. Then they sat in the living room of the chalet with an after dinner drink and that feeling of not wanting to see another morsel of food for a week. And only then did he take the baby from Jasmin and examine him thoroughly. “Doctor, when did YOU become an expert in children?” Alec asked him. “No childhood?” Wyn looked at the baby. She wasn’t sure if that was a good thing or a bad thing. She had spent most of her teenage years wishing she was older, wishing she didn’t have to do as she was told, tidy her room, do her homework, do the washing up. She detested that ‘while you’re under my roof’ stock lecture her father gave when she was rebellious. She WANTED to be free to do as she liked. And now she was, and especially today, Christmas, she had been thinking more and more about how valuable a loving home and parents and the security of being in a family was. As fun as this day had been, thanks to The Doctor’s efforts to make it so, she actually did miss her family more than she realised. “Is that because you’re part Human?” Wyn asked. “Hang on,” he said. “I think Ali needs to be changed. That’s one thing that all babies have in common, alien or not.” He took the baby and headed to the bathroom. His friends assumed that nappies had also appeared in the bathroom as part of the same weirdness that had brought the baby and the milk in the fridge. It certainly seemed so when he returned with a much fresher looking baby and a fresh bottle of milk for him. “But it’s only half an hour since I gave him a bottle,” Jasmin pointed out. “Usually at our house on Christmas afternoon we watch a movie and play Trivial Pursuit,” Alec said. “Except where Ali comes from and why,” Jasmin pointed out. “I intend to find out,” The Doctor said as he returned with his arms full of very technical looking equipment, the most obviously recognisable piece being an electronic microscope. He opened a small case and assembled a syringe then told Jasmin to hold Ali tightly while he took a blood sample. The child’s head turned and looked at him as he inserted the syringe in his arm but he didn’t utter a sound and he didn’t seem to be in any way upset by the needle in his flesh. “Can’t he FEEL?” Jasmin asked. They had noticed that. He arrived in a sort of pale green all in one outfit and as he developed the clothing seemed to have expanded as well. That would have seemed a long life to the Humans he was talking to if they didn’t know HE was 1,000 years old. “I can tell a LOT from his blood. And the TARDIS can tell me a lot more.” He turned to one of the other pieces of equipment he brought. It looked like a laptop computer except one that had been hand built from half a dozen laptops and additional technology from several different periods of history. There was a board full of old-fashioned glass valves and wires and a printed circuit board as well as something that looked like it came from the far future all making up part of the fantastic gadget. “What is it?” Wyn asked. The Doctor gave him a hurt look. He loved the TARDIS. It had grown with him over the years, evolving and changing like a living thing. When people failed to see its intrinsic beauty it always wounded him. “That’s better. Anyway, let’s see what baby Frankie has to say about baby Ali!” He typed rapidly for a long time. Nobody was sure which was the most fascinating thing – his hands blurring as they danced over the keys, the way the valves on the old-fashioned board lit up randomly or the way baby Ali watched it all with rapt attention. “Tagna for short,” The Doctor added. “So… what… they farm out their kids to unsuspecting people on planets with clean air?” Wyn asked. “Ali looks hungry again,” Jasmin interjected. “I’ll go get another bottle.” She carried him with her into the kitchen. When she returned she was puzzled. “This isn’t milk,” she said as she held up the bottle. The Doctor took it from her and dribbled a few drops on the back of his hand. He tasted it and said it was a sort of protein soup and perfectly nutritious and gave it back to her to feed the baby with. “What if the whole world is full of them?” Wyn added. “If you think that, then kill him,” The Doctor told her. “What?” Wyn stared at him. Wyn looked at him with her mouth half open in astonishment. What he was saying was so cold, so logical. It made sense in a way. But when she looked at the baby it was the most outrageous statement she had ever heard. And the fact that The Doctor said it made it all the worse. She looked back at him. “Ok,” he sighed. “I suppose you expect me to do all the dirty work as usual.” He stood up and made towards the kitchen. He came back with the carving knife in his hand. It still had crumbs of turkey meat on it. The doctor took a handkerchief from his pocket and cleaned it carefully and deliberately. “Well… yes…” she admitted. “I suppose I do. I mean… when I’m older… when I have my career sorted and Alec and me are….” She blushed. So did Alec. The idea of them as a family was still no more than a dream yet. They still had so many problems to resolve, not the least of them the one that made them run away to Scotland together in the first place. Jasmin did as he said. She sat on the floor with Ali. And after a few experimental minutes he crawled very well. So well that they all spent a very energetic couple of hours chasing him around the room and stopping him reaching the more dangerous places such as plug points and discovering just how many unlikely things a small child would want to put into his mouth. By five o’clock, when he had reached the physical development of a one year old and they sat down to eat tea together, he sat on The Doctor’s knee and shared the food on his plate as well as his own bottle of nutrient from the fridge. “He’ll be walking soon,” The Doctor said. Ali walked for them after tea as they settled down for the evening. His first upright steps across the room were supported by K-9 but after a couple of trials he managed to step away and totter from Jasmin to The Doctor. He lifted him and swung him up in the air joyfully. Ali’s face crinkled into a laugh but he still made no sound. “Let me look into your mind,” The Doctor said. He sat the child down on the chair and knelt in front of him, gently placing his hands either side of his head. He didn’t know if Ali could understand what he wanted to do. He didn’t want to frighten him. Some beings could feel a mental mind probe. It wasn’t painful or unpleasant but it could be frightening for them. Ali didn’t seem frightened. He looked at him with those big, black eyes of his and blinked several times. “No,” The Doctor said. “It’s his way of communicating. It’s like morse code… except not morse code obviously since that’s a Human language. He’s trying to talk to us.” The Doctor closed his eyes and concentrated for a long, silent minute. “Ahhh!” he drawled slowly. “Now I understand you.” He looked directly at the child’s face and blinked rapidly himself. Ali’s face broke into a smile and he reached his arms out. The Doctor hugged him tightly. “He called me Doctor,” he said proudly and with slightly moist eyes. Whether that was emotion or simply a reaction to the blinking nobody was sure. “He pronounced it wrong, but for a year old, it wasn’t at all bad.” He turned and found a piece of candied fruit and gave it to him as a treat for going through the ordeal of a mind probe. Ali sat quietly and chewed it. The Doctor picked up the portable console and looked at it thoughtfully then sat down and began to dismantle it, removing components to build into something else. Alec watched him intently. It looked like he was constructing something like a small radio receiver. “Doctor!” Wyn laughed. “It’s amazing as it is. No need to worry about how it sounds.” She turned in surprise as Ali toddled across the room to her and held out his arms. “Wyn…” the voice said. And then there was a sound just like a child’s laugh if it was generated by a computer. Wyn laughed and picked him up. How could she have ever imagined he was evil in any way? “Tired,” he said next. And nobody was entirely surprised. It had been a long day for them all. Wyn gave him back to Jasmin and she made him a bed on the armchair where she had been sitting most of the afternoon looking after him then she sat by his side, stroking his dark hair and calming him. “What’s going to happen?” Alec asked in the quiet that came upon them after he was asleep. Jasmin looked up at The Doctor. She wondered why he had addressed that to her specifically. But Alec and Wyn understood. They could see how attached Jasmin was becoming to the child. They were fond of him too, in their own way. Watching him grow, by the hour, felt as if they had watched him grow in the ordinary way. They felt he WAS a part of their family now. And to give him up was not going to be easy. But it was going to be harder for Jasmin. Alec went and sat next to her. He hugged her close to him and whispered something to her that was not meant to be heard by either The Doctor or Wyn. It made her smile and she kissed him in return. They made it a quiet evening. They didn’t watch TV and they certainly didn’t play Trivial Pursuit. Nor did they talk about what would happen when the Tagnans came to collect Ali and take him home. They talked of some of the things they had seen and done in the time they had all been together. Wyn persuaded The Doctor to tell them his own version of some of the stories she had heard from her mother in her childhood. He was remarkably reticent about talking about events in which he had been the hero, but she pried some of it out of him. Ali woke up again just before midnight and informed them he was hungry. He drank some of his own protein food and ate a large piece of Christmas cake. The others ate cake and drank cocoa and thought about bedtime. They went to bed reluctantly. Jasmin was practically dragged away by Alec. Even Wyn didn’t want to leave Ali, and of them all The Doctor would have said she was the one least likely to have parental feelings toward him. Jasmin and Alec were a couple and they would be parents one day. It was in their destiny. But Wyn had a different kind of future, one way or another. Happy, yes, but not in the way people envisaged their daughters would be happy, with a husband and children. Yet even she had warmed towards the child once she had got over her fears. Yes, he had been a father once. He had been happy – blissfully so - with the kind of domesticity most Humans take for granted. But it was so long ago it hurt to think about it. His own feelings for Ali surprised him a little. His own feelings when he turned around and found the child there, when he had first lifted him into his arms and comforted him, feeling his newborn confusion about the world he was suddenly plunged into, had been ones he had forgotten he even had. He had loved the child as if it was his own. Was that part of the plan, he wondered? Was there something about these babies that automatically made you love them? “Come here, little one,” he said to the child quietly, and Ali came to his arms. He sat on the armchair in front of the fire with him and held him quietly for a while, not wanting to frighten him. Then very gently he let his mind probe his again. The door having been opened once it was easy to do it again. He saw a much more fully formed and mature mind than earlier. He was growing up fast. He saw his feelings of safety and contentment as he sat in his lap. He knew he was in the arms of somebody who would protect him to the death if necessary. “That I would, child,” he whispered. He looked deeper. He felt his emotional attachment to all of them, to himself and to Jasmin especially, but to Alec and Wyn, too - his Earth family. But there was something there in the back of his mind. The Doctor probed and was surprised, and just a little shocked at what he found. He was right, first of all, about the pheromone that was produced naturally. It came from the same source as the enzyme that allowed him to grow so rapidly, and it, too, would be depleted when it was time for him to leave them. The chemical ‘spell’ that bound them to him would be broken. When the time came, something would be released into his brain. Another chemical, that would, while not erasing his memory of his first days of life, of the people who had loved and cared for him, would detach him emotionally from them so that he would happily go home to his real family without feeling any trauma from the parting. He thought about some of the traumatic partings he had experienced in his life and sighed deeply. Ali didn’t reply. None of what he had said made any sense to him. His understanding of the world was that of a two year old, after all. He only knew that somebody loved him. Why they loved him was more than he could grasp. The Doctor stayed with him through the dark hours of the night. It snowed outside, obscuring the stars. He was a little sorry about that. He liked to see the stars. But the snow was pretty to look at, too. He took Ali and stood by the window for a while. 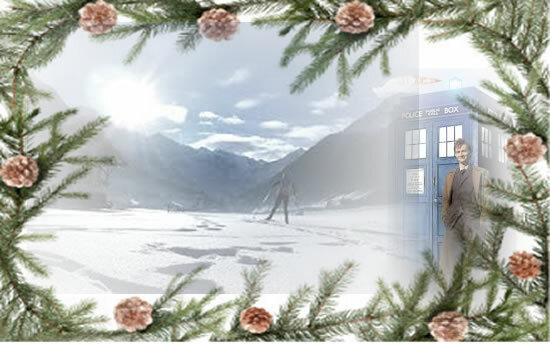 With his Time Lord eyesight he could see the unique and beautiful crystal shape of each snowflake that fell. He put his hand against the child’s head and gently transmitted the pictures to him. He gurgled and laughed in appreciation of one of nature’s great wonders, the perfection of something so small the naked Human eye could not see it. That game kept him amused until he began to be sleepy again. The Doctor pulled out the futon bed and laid him in it, pulling the blankets around him and kissing his forehead gently before he went back and sat in the armchair by the fire. He could do without sleep easily. Most nights when his Human friends rested he spent a few hours in a meditative trance to refresh his body and then spent the rest of the quiet time in some work or other around the TARDIS. Tonight, though, he did not sleep at all. It wasn’t that he was concerned for any danger of any kind, or was concerned for the child. But it was like Wyn had said about missing something. He felt he wanted to watch the child grow, even in his sleep. He didn’t want to miss a moment of it. It was just after five o’clock, just after what would have been his third birthday, that Jamin crept into the room. She went to the futon and looked at the child sleeping. She bent and kissed him and then turned and saw The Doctor sitting there, watching her. When he returned with the tray she was sitting on the futon, beside the sleeping child, softly singing an old Arabic lullaby. He waited until she was finished to give her the tea. “I’ll look up your children and say hello,” he said. “Could be worse,” he grinned. They talked a little more as Ali slept on, still growing as he slept. After a while The Doctor looked up and saw that Jasmin had fallen asleep on the futon. He pulled the blanket around her and sat back down again to watch over both of them until morning. It snowed again for an hour or so before dawn. It was just tailing off about eight o’clock when Jasmin woke up again. Her first thought was for Ali, and she smiled as she saw him sitting up beside her looking bright and expectant. And they did just that. They built snowmen and snow ladies and snow Daleks and threw snowballs at them. Ali learned how to throw a snowball nearly as well as the adults and his electronic laughter rang out constantly. They all had about the best time they could possibly have. They stopped only to eat lunch and then they were out again in the winter sunshine, taking it in turns to take Ali for rides on a sled The Doctor found in the log-shed. They played until the sun went down and then returned to the chalet for tea. Ali sat up to the table on his own chair, with two cushions to raise him up to the right height. He ate all the good things that were offered to him and chatted happily with a four year old vocabulary. After tea though, as Jasmin and Wyn and K-9 played with him on the rug by the fire his mood seemed to change. He became distracted from the game and wandered to the window, staring up at the sky. The Doctor looked at him for a moment then went and stood with him. “Tonight?” The Doctor asked him. Ali looked up at him and nodded. They went by TARDIS. It was already dark and the ski-lifts were closed so it was the quickest way down. The Doctor parked the incongruously English police public call box in the customer car park of the modern shopping centre. Since it was evening of Boxing Day, it was closed, of course. But there was security lighting and a fountain at the front of the centre was prettily uplit. There were people heading for the fountain. The Doctor’s first guess about the town being used as stand in parents for Ali’s brothers and sisters was right. There were about a hundred all told, he thought as he did a rough head count. Families, couples, single men and women were arriving from all directions, and they all had a five year old alien child with them. There were boys and girls, all with black eyes and dark hair, but otherwise as different in their features as any collection of five year olds. They looked at each other warily and clung to the hand of the foster parent they had emotionally attached to in the past two days. The Human families all looked a little dazed and confused and not a little upset. Many of them were crying. “Please…” One woman was crying to the little girl who was pulling her hand to get closer to the fountain that was the centre of their attention. “Please don’t leave me, Liebling. I will be lonely without you.” Her husband was doing his best to soothe her, but she was nearly hysterical. The Doctor looked at the couple and stepped forward. Without a word he put his hand on the woman’s forehead and gently soothed her anxieties away. She looked at him and sobbed quietly still, but without the hysteria that was harmful to her. Her husband comforted her as well as he could. Nobody thought to ask The Doctor what gave him the authority to organise the children. He seemed to know what was happening and why. The people kissed the children and hugged them tearfully and pressed teddy bears and dolls and toys of all kinds into their hands. The Doctor looked at Ali and wondered what he could give him. He reached in his pocket and took out his TARDIS key. He looked at the unique design on the keyfob. Six stars in a double arrowhead formation - the constellation of Kasterborus, where his home used to be. He strung it on a piece of string and swapped it for the translator he would no longer need. “I want you to keep that,” he told Ali. “As a reminder of me, of all of us.” He kissed him on the cheek. Jasmin and Wyn and Alec all came forward and kissed him goodbye, too, then they all stood away with the rest of the crowd and waited. They weren’t sure exactly what they were waiting for. But they knew it was going to come from the sky. They shielded their eyes against the light pollution of the modern city and tried to see if there was anything unusual in the sky. For nearly an hour there wasn’t. Some of the people started to murmur about it being too cold for the little ones to stand around there like that, but The Doctor told them to be patient, to wait, quietly and calmly and not to be afraid of what might happen. Then somebody with sharp eyes gave a shout. The Doctor looked up and knew they were right. There was a star that wasn’t a star. It was getting bigger by the second and very soon they could make out a shape. He laughed. It really WAS a flying saucer by every clichéd definition of the word - circular, with lights all around the outer edge and in a ring around the middle of the underside. As it hovered over the fountain a circular hatch opened up and a beam of bright light shone down. The people murmured anxiously as the light enveloped the fountain and the children in a circle around it, holding hands with each other. “Goodbye, Ali,” Jasmin called out. “I’ll remember you.” Taking their cue from her all the other foster parents called out farewells to the children they had looked after. The children answered by raising their arms and waving as one. And then the light got even brighter for a few seconds and then faded away. When it was gone, so were the children. The ship hovered for a few more seconds and then it took off vertically, very fast, and was gone. There was a silence afterwards, broken only by the sound of police cars heading to the scene to find out why more than a hundred people had decided to converge on the closed shopping centre, and whether it was anything to do with the strange lights in the sky that had been reported to an overworked emergency switchboard a few minutes before. The Doctor stepped forward and met the lead car. He quietly and calmly explained that there was absolutely no problem, that the people were all going home now for a hot drink and an early night and the lights in the sky were nothing but an atmospheric disturbance. The policeman thanked him for his time and ordered his officers to return to the station. “We’ll never see him again, will we?” Jasmin said as they waited until all the crowds had dispersed before they made their way back to the TARDIS.